A year ago I binned my scales in a sort of dieting rebellion and decided that I didn’t need to obsess over the numbers on the sad step. 2017 was to be the year I broke the habit of a lifetime – I wanted to do a whole year of not weighing myself, and break the obsessive pattern I’d got myself into. I made it through until late January 2017, when I had the infamous fat-shaming hospital appointment and it kick-started a depressive episode that lasted until August. I was so upset that I’d made the decision to not weigh myself, and to live a healthy life and not be hung up on the numbers on the scales but everything in life seems to be about weight – every single hospital, GP or nurse appointment I’ve ended up being weighed, politely(although not always) reminded that I am classed as morbidly obese and that I should lose weight. There’s this thing about being overweight that medical professionals don’t seem to realise – every you look in the mirror, get dressed, or look at food you are reminded. It’s like a sadness for me – I’m reminded every minute, every hour, every day of how fat I am, and it feels like no one seems to realise how soul destroying it is to be stuck in a vicious circle of binge eating and starving. I’ve been told previously that I have an eating disorder, Binge Eating Disorder to be exact, yet because I’m neither too thin or too fat it’s not taken seriously. It’s assumed that you have a thick skin too – that it’s okay to publicly fat shame you or comment on your eating or appearance. It works both ways, too – underweight people suffer in the same way. 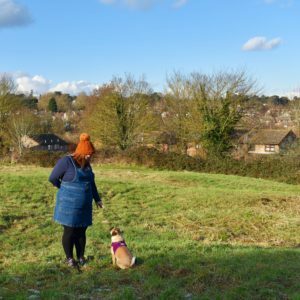 In August 2017 I rejoined Slimming World and ended up back in a despairing cycle of weighing myself – I lost just over a stone, and I have nothing bad to say about it except that it’s not right for me, and so I’ve gone back to calorie counting. I’d told myself that I’d weigh myself monthly at my local chemist, and that I was okay with that. And then three days ago I bought a new set of scales. I know, I know – that goes against every single thing I’ve just said – but I’m so obsessed with my weight I can’t live without knowing. I’ve been calorie counting for a month and I’ll admit I’ve not been doing it properly – I’ve been living on processed rubbish and I’ve lost the motivation. And the scales sadly keep me motivated, as much as I hate to say it. Why can’t I stay away from the scales? Why, as a nation are we so obsessed with weight? Are you stuck in a similar predicament? Have you found a way to ditch the sad step for good?